A remote control "spy helicopter" has been helping police patrol a major music festival. 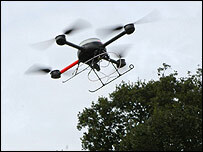 Staffordshire Police have been using the CCTV drone for the first time at the V Festival site this weekend. Officers said the remote controlled plane helped capture offenders at the festival site at Weston Park, on the border of Staffordshire and Shropshire. By Sunday police had arrested 62 people in total at the festival and had cautioned more than 100. Officers said 32 of those arrested had been found possessing drugs. The remote control drone was being used particularly in the festival's car park to catch criminals attempting to break into vehicles. Police said they expected to use the technology at future big events. Ch Insp Pete Owen said: "We are delighted to be trialling the drone. "It will work in addition to the CCTV that we will monitor on site throughout the festival. "Our message to criminals is that we will be watching you and you will be arrested if you are caught on camera." People travelling to the festival on Friday faced traffic delays of hours because of motorway congestion. Highways Agency officials were forced to close a slip road on the M6 to help ease the traffic problems. 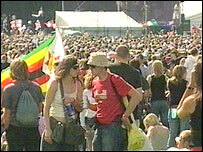 The two-day festival has attracted about 90,000 people to the park.